^ Prior to the formation of the U.S. Coast Guard by merger of the U.S. Revenue Cutter Service and the U.S. Life-Saving Service in 1915, the Revenue Cutter Service had been under the control of the U.S. Department of the Treasury from its creation in 1790. The U.S. Life-Saving Service dated from 1871 and was also under the control of the U.S. Department of the Treasury. ^ 1.0 1.1 When was the Coast Guard established?. Coast Guard History: Frequently Asked Questions. Coast Guard Historian's Office. 13 July 2013. ^ Coast Guard Snapshot 2012 (PDF). United States Coast Guard. [3 February 2013]. ^ Homeland Security Budget-in-Brief Fiscal Year 2009 (PDF). United States Department of Homeland Security: 53. 2009. ^ 4.0 4.1 United States Coast Guard. Daily Chronology of Coast Guard History. United States Department of Homeland Security. 2003 - Administrative control of the Coast Guard transferred to the newly created Department of Homeland Security from the Department of Transportation, where it had served since 1 April 1967. ^ United States Coast Guard. Timeline of Coast Guard Organizational History (PDF). United States Department of Homeland Security. [18 January 2014]. 1 April 1967: Executive Order 16781 transferred the Coast Guard from the Treasury Department to the newly-formed Department of Transportation. ^ United States Coast Guard. Timeline of Coast Guard Organizational History (PDF). United States Department of Homeland Security. [18 January 2014]. 1 November 1941: President Roosevelt's Executive Order 8929 transferred the Coast Guard to Navy Department control. In compliance with Executive Order 9666, the Coast Guard returned to Treasury Department control. ^ United States Coast Guard. Timeline of Coast Guard Organizational History (PDF). United States Department of Homeland Security. [18 January 2014]. 28 August 1919: Coast Guard reverted to Treasury Department after President Wilson signed Executive Order 3160. ^ United States Coast Guard. Timeline of Coast Guard Organizational History (PDF). United States Department of Homeland Security. [18 January 2014]. 6 April 1917: With the declaration of war against Germany the Coast Guard was transferred by Executive Order to the control of the Navy Department. ^ An Act To create the Coast Guard by combining therein the existing Life-Saving Service and Revenue-Cutter Service. January 1915 [8 September 2013]. （原始内容存档于2013年9月8日）. Be it enacted by the Senate and House of Representatives o the United States of America in Congress assembled, That there shall be established in lieu of the existing Revenue-Cutter Service and the Life-Saving Service, to be composed of those two existing organizations, with the existing offices and positions and the incumbent officers and men of those two services, the Coast Guard, which shall constitute a part of the military forces of the United States and which shall operate under the Treasury Department in time of peace and operate as a part of the Navy, subject to the orders of the Secretary of the Navy, in time of war or when the President shall so direct. When subject to the Secretary of the Navy in time of war the expense of the Coast Guard shall be paid by the Navy Department; Provided, That no provision of this Act shall be construed as giving any officer of either the Coast Guard or the Navy, military or other control at any time over any vessel, officer, or man of the other service except by direction of the President. 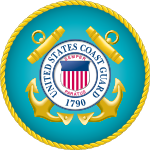 ^ U.S. Coast Guard Heraldry (PDF). United States Coast Guard. April 2011: 3-1.